As the ratio of grey to natural hair color shifts and becomes the majority, the challenge to dye increases. If you have only a little grey opt for a few highlights to blend them away. If your hair is naturally dark, consider lightening up two shades to minimize their appearance. – If you’ve never touched up your greys before, ask your hairstylist for getting started advice. Although your stylist may try to encourage you to let them color your hair, if budget is an issue, explain your reasons for wanting to do it at-home and ask for dye and related product advice. – Not all professional or consumer hair dye formulas work the same on all types, textures and conditions of hair. 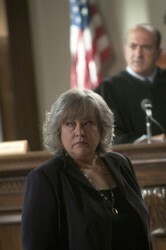 Some gray hair types and texture will be more resistant than others. While you can take grey hair dye product recommendations from friends and family, ultimately you will have to find the hair dye which works best for you and your grey hair needs. Whether you go to a professional or do your grey dye at home always start by evaluating your skin and eye tones with your current hair color to determine the best dye to use for grey coverage. If you decide to dye at home select dye formulas specifically advertised on the box to provide 100% coverage of grey hair. L’Oreal’s Excellence Creme or Superior Preference are both designed to provide full and complete grey coverage. 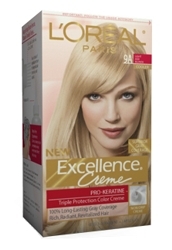 L’Oreal Excellence To Go root touch-ups can provide quick and temporary grey coverage. 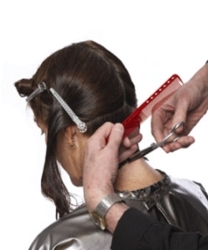 Begin hair dye application at regrowth lines and use a dye brush for more even application. Apply dye in no larger than 1/4 inch sections. Blend through, coloring to line of demarcation. Process for 30 minutes. 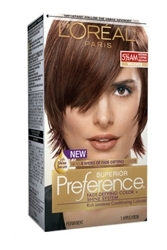 Do not apply color over previously colored hair. Near the end of the color process draw the color through to the ends. Process for an additional 10-15 minutes. Total processing time should equal approximately 45 minutes. In most cases the best developer will be 20-volume. If you use an off-the-shelf kit the developer will be included. If you use a permanent color a developer will not normally be required. Permanent dyes advertised as formulated to completely cover grey are the best option. Semi-perm dyes may not cover grey hair. Any formula which contains less than 20 volume peroxide may blend grey but it may not completely cover it. When coloring grey hair make sure you follow the recommended processing time. While it’s okay to leave the color on longer, it’s not okay to cut the suggested time. Extremely resistant hair can be hit with heat after the dye has been applied (apply a plastic cap) to open the cuticle and help the dye penetrate deeply and evenly. If grey hair doesn’t take the color well make sure not to process in a cool or drafty area. This entry was posted on Friday, December 9th, 2011 at 7:00 pm	and is filed under Gray Hair. You can follow any responses to this entry through the RSS 2.0 feed. Both comments and pings are currently closed.